Italy marked a day of national mourning Saturday for the 290 people confirmed killed so far by Wednesday’s powerful quake that devastated four towns in the mountainous heartland of the country and rattled the central agricultural regions. 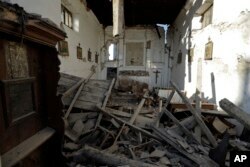 But as political leaders gathered for a state funeral for 35 of the dead in the city of Ascoli Piceno, which didn’t suffer any serious damage itself from the midweek temblor but felt the quake, recriminations started to fly over the devastation caused by the country’s biggest earthquake in seven years. Regional public prosecutors said they would investigate why recently constructed public buildings, including a schoolhouse renovated in 2012, failed to withstand the quake’s force, but they also threatened to file charges against private-property owners who may have altered their houses, most very ancient, in ways that breached building codes and anti-seismic engineering regulations. The prosecutors’ threats enraged survivors and relatives of the dead, which they dubbed insensitive. And they stressed that renovation work seldom observes the country’s notoriously complex building regulations, which more often than not are bypassed by homeowners with a bribe or a fine agreed upon with their local officials. Paintings hang on the walls of the earthquake-damaged church in the village of Santi Lorenzo e Flaviano, central Italy, Aug. 27, 2016. “Our houses are hundreds of years [old] and it is impossible or prohibitively expensive to make changes within the regulations that are drawn up by the government in Rome without any regard to our economic circumstances,” said Perluigi, a retiree from Amatrice, the worst hit of four towns devastated by the midweek quake. He asked for his full name to be withheld because he had recently renovated his property. The chief prosecutor of the province of Rieti, Giuseppe Saieva, appears to have little sympathy for traditional arguments about building codes and complaints about the byzantine, slow-moving bureaucracies that homeowners have to battle to get anything done. He said he intended to mount a house-by-house investigation and was prepared to file criminal charges against anyone — even those who lost family members — if their renovations failed to observe anti-seismic regulations. “If you moved a partition, you risk being charged with manslaughter,” he argued. Saieva added: "There is the responsibility of nature and seismic activity, and then there is the responsibility of individuals.” The prosecutor said he was considering ordering police to mount a round-the-clock guard on the rubble of Amatrice’s municipal buildings to ensure documents and computer hard drives that survived the quake weren't removed. 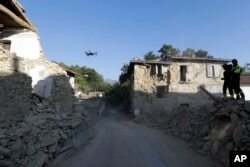 Firefighters operate a drone to survey quake-damaged buildings in the village of Cossito, central Italy, Aug. 27, 2016. As the prosecutor issued his threats, nine more bodies were dug out by emergency crews from the rubble of Amatrice, which so far has accounted for 230 of those killed midweek. Earlier Saturday, Italian President Sergio Mattarella toured the mainly medieval hilltop stone town to see the damage for himself before traveling to Ascoli Piceno for a funeral held in a sports hall where 35 wooden coffins were lined up. On the top of the coffins were flowers and photographs of those who lost their lives. The dead being honored at Ascoli Piceno came from Arquata del Tronto, another one of the towns devastated by Wednesday’s magnitude-6.2 quake. 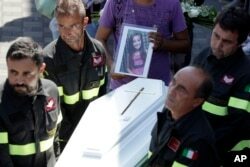 Two of the caskets contained the remains of two children — Marisol Piermarini, 18 months, and Giulia Rinaldo, 9, whose younger sister survived and was found by a rescue crew holding her dead sibling. Italian Prime Minister Matteo Renzi repeated his promise at the funeral to rebuild the shattered communities, but the mayor of Amatrice urged the government not only to rebuild but also not to repeat the snail's-pace postquake reconstructions of recent years. Renovation work on the city of L’Aquila, which was severely damaged in a 2009 quake, still remains incomplete and more than 8,000 of the city’s inhabitants are still housed in temporary accommodations. “What we need is a reconstruction in record time. It is a great opportunity for politicians to show extraordinary commitment," Mayor Sergio Pirozzi told Mattarella. The coffin of Giulia, 9 years old, is carried outside the gymnasium at the end of the state funeral service in Ascoli Piceno, Italy, Aug. 27, 2016. As Italians observed a day of national mourning, President Sergio Mattarella and Premier Matteo Renzi joined grieving family members for a state funeral for 35 of the 290 people killed in Wednesday’s quake. 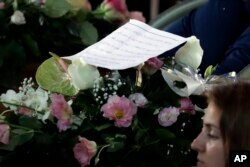 Outside the packed sports hall, hundreds of locals came to pay their respects. “Even if I didn't know them, my heart broke for them. My thoughts are with them because there are people who have lost everything, homes, loved ones,” local resident Luciana Cavicchiuni told reporters. A message is seen during the state funeral service of some of the earthquake victims in Ascoli Piceno, Italy, Aug. 27, 2016. In an interview with Rome’s IL Messaggero newspaper, Fabrizio Curcio, an engineer and head of Italy's Civil Protection Department, warned that earthquakes in Italy, which is built on two major seismic fault lines, have become a fixture and that the time between big temblors is shrinking all the time. He argued that Italians need to rethink what they expect from the government in terms of rebuilding damaged towns and homes. Currently, the vast majority of Italians do not insure their homes, let alone have earthquake insurance. Many private-sector insurers don’t even offer quake insurance, even if a homeowner requests it. This needs to change, said Curcio, who thinks Italians need to be willing to have their homes assessed by insurers from a seismic point of view. “I believe this is the model to aim for, even, to limit the burden on the state,” he maintained.